I’ve always been really impressed with what craftsmen can make when they have the right tools. My close friend, Mick, of Relyea Custom Cabinetry is one of those people. As a custom cabinet maker, a big part of what he does all day is cut wood. He has dozens of saws. They all cut wood, but they’re not interchangeable: Mick wouldn’t use a band saw when the job calls for a table saw. Similarly, we “knowledge workers” have lots of communication tools, like email, telephones, blogs, SMS, Twitter, instant messaging, etc. But for some reason, we often don’t always use the right tool for the job. Email has its place. Probably the most overused knowledge-worker tool is email. To some, it’s like a Swiss Army Knife. Yes, there is a saw folded up in there (it’s right next to the tiny scissors and little wrench), and it may work in a pinch, but it’s not always the best tool for the job. Email is great. But let’s not forget its roots: mail. Email is faster than the USPS, but it’s not faster than a phone call, or SMS. And more importantly, even though some people check their email every time their BlackBerries buzz, it’s not all that common: most people check their email rather than having it check them. Time sensitivity is a factor when deciding which of your knowledge-worker tools to use. If you need an immediate response or reaction, you’d better reach for something other than email. An actual phone call (remember that tool?) is best because it is a synchchronous interaction: you confirm receipt and understanding of the message (can you hear me now?). If there is a last-minute time change for an important meeting, email is not going to cut it. You need to know that the participants got the message. So, how do we tame the tech? Well, technology is not the problem. We are the problem. Email is not evil, but in the wrong hands it can cause havoc. It is a very effective tool for certain tasks; but it’s just one tool. And like all tools, we need to learn to use email effectively. Tim Sanders has a blog that tries to educate people about email usage and etiquette. Please read it. Tim Ferriss advocates checking email only a couple of times a day. That may be impractical for some people, but the alternative–responding to email as if it were a real, live conversation–will send people the wrong message. After choosing the appropriate tool, Mick would say “measure twice, cut once.” That’s good advice. But, many of us are not as good at tool selection as Mick is. We knowledge workers should back up a step and think twice before even selecting our tool. Before you send your next email, ask yourself: is it the right tool for the job? Will it achieve the desired results? Should you call or wiki instead? Maybe just walk down the hall and have a good, old-fashioned, face-to-face chat. Fabulous post! I know I often over-use email, but not because I expect an immediate response, more because I prefer not to bother people. For example, if you are in the middle of a project you might not want to be interrupted by the ringing telephone. So I use email as my default so that people can respond at a time of their choosing. I do think when a response is urgent or critical that the phone is a much better choice though. 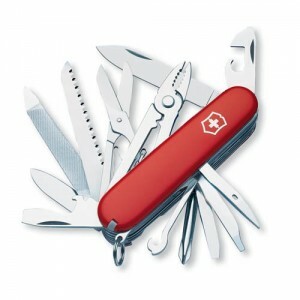 I like Swiss Army Knife,It’s very cool! Although the social software is practically nil in the enterprise where I work, I still try to reduce email, by using the phone, or by using some prehistoric instant messenging tool, or simply by going directly to the person if he or she is not far away.